A Khmer pop song of the 1960s is the pulse of a new feature film about three generations of a Cambodian family that will premiere in Los Angeles in early May. The film, “In the Life of Music,” tells the story of a Cambodian family living through the 1960s to the 2000s using popular music of the times to propel the narrative. The highlighted song is ‘’Champa Battambang’’ by Sin Sisamuth, one of Cambodia’s most influential and prolific pre-war recording artists. The 92-minute movie, co-directed by Caylee So and Sok Visal, will be screened at the 34th Los Angeles Asian Pacific Film Festival on May 5. It is in Khmer with English subtitles. Sin Sisamuth was active in the Cambodian music scene from the 1950s through to the mid-1970s when he disappeared after the Khmer Rouge took power. Caylee So said the film is about love and perseverance in the face of adversity. Sok Visal, in his mid-40s, is the creative director of 802AD Productions, a Phnom Penh film company. He previously produced popular films such as Kroab Pich, Jailbreak and Poppy Goes to Hollywood. Caylee So is the co-founder of the annual Cambodia Town Film Festival in Long Beach, CA. Her previous films include the short film “Paulina” which portrays a Cambodian-American girl who falls into gambling in the midst of the community she grows up in Southern California. Caylee So grew up in Virginia, studied film-making in California and is an Iraq War veteran. ‘’In the Life of Music’’ stars Cambodian-Canadian actress Ellen Wong and Arn Chorn Pond, the co-founder of Cambodian Living Arts, a non-profit that works to support the revival of traditional art forms. 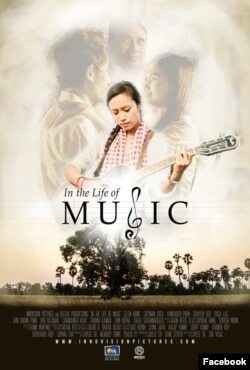 ‘’In the Life of Music’’ tells the story of a Cambodian family from the 1960s into the 2000s, using a well-known 1960s pop song by legendary singer Sin Sisamuth to help propel the narrative. A Cambodian documentary film titled ‘Angkar,’ is also set to make its’ North American debut as part of the L.A. festival. The documentary was directed by Neary Adeline Hay and is about victims and survivors of the Khmer Rouge encountering perpetrators years later, according to the festival. Neary Adeline Hay was born in Cambodia in 1981 and studied film in France. The 71-minute documentary is in Khmer and French with English subtitles. Caylee So said the idea for ‘’In the Life of Music’’ was born during a visit to Cambodia in 2015. “The idea of making a film in Cambodia just felt like something I had to do because the landscape was so beautiful and the people were so beautiful, and the story was so raw, but nobody was telling them,” she said. Caylee So said the film goes deeper into Cambodia’s past than some other films which choose to focus primarily on war and mass deaths under the Khmer Rouge.